Our Braun Series 9 electric shaver review will provide you with detailed specifications for the 9290cc model in this series. You will find information on how Braun designed its Series 9 product, what they intended for these designs, some of their most important functions, a list of the top pros for the Braun Series 9 electric shaver, cons that the company could improve, and opinions from current users. What Was the Braun Series 9 Electric Shaver Designed for? The company updated the Series 9 shavers recently. However, most users report that aside from giving a gold or titanium coating to models such as the 9295cc, these new Braun Series 9 electric shavers perform identically to the previous models. They use a series of five shaving elements that work together to give you a shave that is both close and clean. Because the Braun Series 9 electric shaver combines so many shaving elements into a single product, you should not need to rely on any extra tools or accessories to get the shave you want. In most cases, this item will already have everything you need for trimming, close shaving, and grooming your facial hair. This section of our Braun Series 9 electric shaver review lists some of the top features of the lineup and how they work. While you may find additional positive functions as you use one of these devices, our list represents some of the qualities that may make the Braun Series 9 electric shaver a standout product. The Braun Series 9 electric shaver is completely waterproof. This feature makes it an ideal shaver for use in the shower or other wet shave conditions. It includes a charging station that can also clean and lubricate the unit automatically as it charges. The shaving head on the Braun Series 9 electric shaver is flexible and can adjust to the curvature of your face with ease. You can charge the Braun Series 9 electric shaver in just one hour. The charge on the shaver’s battery lasts almost as long as its charge time at about 50 minutes. You’ll receive a convenient pouch to carry the shaver and its accessories with you during travel. It also features a handy travel lock mechanism to keep it secure during your journey. The LED display is easy to understand and use. Braun’s SyncroSonic technology may help the shaver to adjust its power levels to deal with your beard based on the thickness of your facial hair. The package includes four distinct cutting elements that can make use of a single skin guard. One Series 9 silver electric shaver. A charging station that can also clean the shaver. One cleaning brush for shaver maintenance. A cleaning cartridge that may help you clean out the inner mechanisms of the shaver. We’ve compiled what we think are the most useful aspects of the Braun Series 9 electric shaver in the section below. 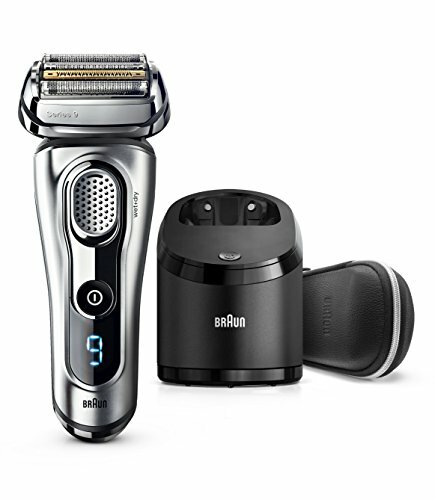 We like that the Braun Series 9 electric shaver seems to be a versatile product. You can use it to shave dry if you prefer this method or are in a hurry. However, it also has a specialized design that makes it waterproof up to approximately five meters. This means you can submerge it fully or use it in the shower without any problems. You should be able to use the shaver with your choice of shaving gel or foam when necessary. The cleaning head, brush, and lubricating stand will help you keep the unit in working order. This shaver is ergonomic and has a textured grip that helps you maintain precise control over it even in wet or slippery conditions. Such a design is a big plus if you plan to use the Braun Series 9 electric shaver with wet hands. It should not slip out of your grasp in most cases. Many electric shavers either have no way to tell you how much battery life they have left or can only give you an approximate amount. In some cases, your shaver could run out of energy halfway through your next shave. However, you don’t have to worry about this problem with the Braun Series 9 electric shaver. It includes a display that tells you precisely how much battery time you have. We found a few things that we think Braun could improve with their next lineup of electric shavers. Although the charging station, brush, and cleaning head help you maintain the Braun Series 9 electric shaver, you may find cleaning out the unit manually to be a tedious task. Unfortunately, you do need to dry the head of the shaver completely before the automatic cleaning function starts to work. This limitation makes the automatic features of the device less useful than they could be otherwise. While some users may find the large shaving head useful, we feel it can be too big to reach the hair on your upper lip or under your nose effectively. This design may mean that you will need to take a few extra passes under that area to get a close shave. Many users that have been customers of Braun and used several of their products in the past say that this electric shaver seems to provide the closest, most effective shave yet. They appreciate that, unlike some other models, the Series 9 does not seem to irritate their skin or cause redness. Other users like that this model is ergonomic and can shave a beard quickly while still getting in close without skipping over some areas. Some users expressed disappointment that the shave was not as close as they were expecting. Nonetheless, many of these users admit that they were blade shavers before they switched to this electric shaver series. The Braun Series 9 electric shaver is one of the few models that is totally waterproof. This makes it easy to use if you favor a wet shave, but it is equally capable of giving you a close, dry shave. Please share your thoughts on this product with us in the section below.